Restless spirit, insomnia, forgetfulness, fatigue, poor appetite, dispel phlegm, stop coughing, wheezing, cough with profuse sputum, asthma, blood deficiencies, weak digestion, tonify qi, loose stools, dizziness and soreness of the low back, hives (urticaria), anti-inflammatory, qi and blood deficiencies are some of the imbalances satisfied clients have used this product for. 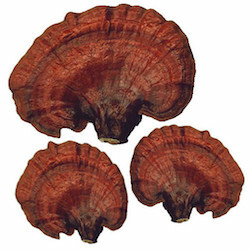 Each bag contains 1 pound whole sun-dried Organic Red Reishi. I find Alive & Well to offer the best of quality products...Will continue to order from again and again!